My WFMW tip for today is going to sound like a shameless product endorsement, but just so you know, I'm posting this of my own free will. My own, free, mildew-hating will. 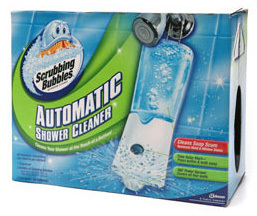 The first time I saw a commercial for the Scrubbing Bubbles Automatic Shower Cleaner, I was indignant. The idea behind it is that you hang this little battery-powered contraption in your shower, and it will automatically spray down your shower every time you press the button. "Really?" I thought. "Have we as a nation gotten so lazy we can't even scrub our own showers?" And then I stopped to try and remember the last time I gave my shower a good scrubbing. And then I shut up. A friend told me this doo-hicky was actually pretty impressive. I found a good coupon for it, and I thought it wouldn't hurt to try. It actually works. Really well! Not only does it keep the shower clean, but it smells SO good. The refills cost basically the same as a regular bottle of shower scrub, so the only additional cost is the doo-hicky upfront (and I think I bought mine for $15 at WalMart, with a coupon--that included two refill bottles). Now, here's the funny part. 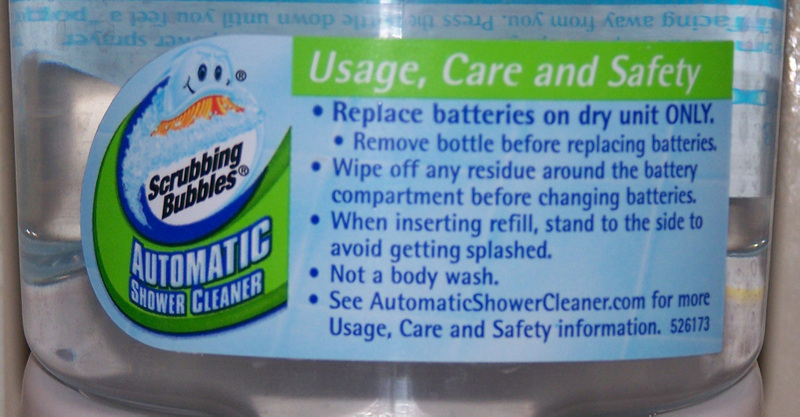 Look at the fifth item: "Not a body wash."
I thought of my three little boys, and their remarkable ability to take showers in which nobody actually comes out clean. And while I can't say I'd be tempted to hose them down with shower-cleaning solution, I'm thinking that an automated device for cleaning off smelly boys may be The Next Big Thing. You just watch. It'll be coming to a Works-For-Me Wednesday soon! If you'd like to play along with Works-For-Me Wednesday, leave your link below. First-timers, please read through the guidelines. 20. Frazzmom- buy groceries and fly for free! 203. Keepin\' Those Earrings Organized! The links are now closed. Please join us next week! Oh my goodness you have to invent that. It would be a blogging sensation! DH has prohibited me from buying one of those, so far. I imagine that I will "sneak" one in the shower some day and he will never even notice, though. What a great tip! I was scrubbing my shower (and fussing about it) just yesterday... I am going to have to check this out! Just wanted to confess that I stole this week's WFMW tip from you! I wrote about the Jesus Storybook Bible that I read about here. My daughter and I are loving it. Thanks! I LOVE my automatic shower cleaner- we have had one for over a year... It does a great job! We have those in both showers but the refills are empty right now. But, I just had to comment because I burst out laughing every time I read the "not a body wash" comment on the bottle! I may have to get one of these. My MIL has one and loves it. Thanks for all of the WFMW fun! The not a body wash comment had me cracking up. I would definitely by a spraying body wash for my son who is also one who remarkably comes out of the shower no cleaner than before. I've always wondered if that shower stuff works! My concern has always been that whatever chemicals in there would be harmful, somehow. Especially if it gets sprayed on everything (like on a razor, a bar of soap, a wash cloth). What do you think? Do you move all that stuff before letting is spray, or do you just not worry about it? My question is how that thing cleans BEHIND the doo-hicky! Do you move all that stuff before letting is spray, or do you just not worry about it? Daiquiri; we've tried it, but not as a body wash ;). Usually we pull everything off of the shower first and let it air out after running the wash.
We have one too. empty. why? I have NO idea, because it DOES work! As far as the body wash thing goes - I have hooks on the shower wall for bath puffs and I had to raise them all so this stuff wouldn't spray on the puffs. That would have been accidental body wash. I have to go to Walmart and buy some refills now. I told hubby I'm not the only one who reads the safety thingys and laughs about them, lol. Gotta love what some people think they can do. I have never seen one of those devices before. Anything that means I don't have to scrub is good with me. The only problem is that it would be WAY too tempting for my boys' "what if?". I can imagine them pressing the button 100 times a day to see how it works or sneaking up on their sister to press it when she is in the shower. Oh! I think we would have to give it a miss for the same reason we don't have spray deodorant in the house. The boys just can't help thinking "What if.....?" Great idea though. The shower gel thing would interest me though!!! I'll have to give that a try, I hate cleaning my shower! Those warning labels are funny! It was once pointed out to me that on a tube of KY jelly it says not to be ingested! So obviously we have people out there that think hummm... Jelly.... I think I'll give it a try! Oh good, I thought it was just my boys who managed to spend 20 minutes in the shower and do nothing but rinse, lol! Shannon, I LOVE your new green look. Beautiful and fresh! I have had 3 of them. I loved them...so very much, but after the 3rd one broke, I just couldn't afford another one. Sold. I've eyeing this with much skepticism. Too good to be true. But, last week, my husband entered the shower and never came out. It may be time to clean the shower. I'm also trying this product. I actually got it for $7 after sale, coupon, and rebate stacking. So far I like it, but it is rather loud. I ran it one morning before hubby was up and found him hovering on the floor. Military flashback... I guess it does kind of sound like a machine gun. From that time on, it is HIS duty to push the button. AND might I add... I'm having a blogger birthday GIVE-AWAY so stop over! I was pretty sure I would never buy one of these for the same reason you mentioned. But, my shower is a disaster...so perhaps I am too lazy to clean myself. I am pretty well set on buying one now. Thanks for the review! Also, I messed up yet again when posting my link. I apologize and assure you I will get it right next time. I got one pretty cheap with a coupon/sale/rebate thing...and I don't like it at all. It doesn't seem to spray enough to get anything clean. I wonder if I got a lemon? Oh my gosh! We totally have this! My husband saw it at Sam's Club and I was super against it b/c it looked so stupid but it REALLY helps! It's just a like a daily shower spray to help with the soap build up, but my husband actually USES it! So I don't ahve to go into the shower everytime he's finished and spray it down. Totally works for us. Even though I still kind of think it's stupid. That shower stuff TOTALLY works. And I hate bathroom cleaners because they give me headaches. So to spray and leave is great. My first WFMW! I hope I did it correctly! ROTFL about the boy comment! I've been wondering about that shower stuff for a while now, you might inspire me to actually try it ;). I had wondered if this worked or not! Cool beans; I have a coupon for it right now so I think I will be trying it out! OH my, I just realized I somehow submitted twice-can you erase the #127? I mislabeled it and tried to fix it, which then seems to have made me post twice....sorry!!! Yes, this stuff is good. Cleaning the showers often gets put off---it helps to have something that works. Shannon, I had been thinking of buying one of those for our shower and just hadn't followed through! Now I must! It seems crazy that a little contraption like that could do such a job. I feel lazy, but it'll give me time for other, more important things! I wish it would be invented. I have 3 boys and I could shower them all at the same time and maybe throw my girl in too. I don't know what I was thinking when we built our home. We have white tile with white grout. FINALLY, my best "get the shower clean" idea---my husbands manly muscles. I could scrub and rub away at the grout and it was still dirty. He can take any old cleaner and scrub and the shower is pristine white again. Sorry for doing two links. Thanks so much for hosting. It's been a while since I participated and I've missed it! I think I may give this product a try now. I think you're on to something with that kid-washing version. You'd make a mint! I'd like to hang one outside so I can hose them off before they come inside in the spring! Wow, I can't believe it really works! I'll be on the lookout for a coupon now! Oh, we love our shower cleaner - in fact, I haven't had to do more than a very light cleaning in our shower in over SIX months because of it. Yep, it totally works for me too! Oh Shannon, Shannon, Shannon, I love you and your blog, but YIKES!!! This is a BAD idea from a health perspective. Daiquiri asked about health implications and Joy even suggested borax - a great suggestion. The fact is, we're learning more and more about the health effects of common household cleaning agents and personal care products - the combined effects of these chemical agents are suspected by many researchers of being a leading cause of cancer. Kids absorb many more of these chemicals than adults. Frankly, it would be better to tolerate a dirty shower than to use this stuff!! Or, if you must clean, go green! Hi Shannon, I think I need to buy a Shower cleaner too! Thanks for reminding unknowingly! I'm very intrigued by this. I hate cleaning the shower. You just gave me an idea...if I put watered down body wash in a spray bottle I bet the boys would spray themselves...well they might spray everything else too. Maybe I'll try it. I have had similar thoughts about laziness, Shannon, but some things seem like working smarter, as you discovered about the shower thing. I'll have to check into that next shopping day! ok, i had a friend that was visiting his mom. he had never seen the shower cleaner before and thought it was some cool new body washing gadget. yeah, he hit the button, and was instantly sprayed with cleaner. we still laugh about it when he comes to town! that does it...I'm getting one! my husband was SURE it wouldn't actually work. so glad to hear it does! and when you figure out that spray-down-the-boys shower thingy, i want one of those too. Your downtairs sock drawer inspired me to share my downstairs shoe closet today. P.S. I, too, am thrilled that Patsy Clairmont is blogging! I saw it and was hesitant to try it. I have a standing fight with all these automatic stuff. But after your good review, I might just go to the store and buy it. I have a coupon too. I've thought about buying one of those, but wanted to hear if it worked first. May have to invest in one now! I really need one of these!! I have to confess, I want one of these! But I want to find a way to refill the container myself with my own cleaning solution so I don't have to buy the refill. They didn't have the warning back then, lol. I can tell you why they put that on there. By this point my entire family was rolling on floor laughing and my poor boyfriend was bright red and also laughing. I am excited to try this now! I had read somewhere that it didn't work, but based on your experience I will whip out my cash and pick one up. Oh joy! MY tip is one I stumbled on quite by accident after we suffered a severe water incident from a faulty washer hose. FYI on shower scrubbing, a task I despise but found myself doing endlessly last year when our house was on the market - I disovered that the eraser blocks are the BOMB for scrubbing soap scum off fiberglass. Spray with whatever cleaner you use, then scrub with the eraser block (marketed as the Magic Eraser by Mr. Clean; available as a store-brand just about everywher). It was a downright miracle how it got every bit of the soap scum off the fiberglass without any scratching it. Correction: that should say "this" idea...see what I get for finally commenting?? Ugh. I've seen the commercials and was really skeptical -- but after reading your review and everyone else's comments, I'm going to give it a try. I'm willing to try anything if it will help me avoid scrubbing down the showers! What does it smell like? I've read other consumer reports that these shower cleaners were no good, so this was interesting to me to hear so many of you rave about it. Hmmm...I'm on the fence, having read the good and the bad. I probably won't get one just because of the cost, but maybe someday... just to see for myself. I have one in my boy's shower! And if you figure out that automatic boy cleaner, I have four very dirty boys that could use a good spray down! I'm glad it works for you! For me nothing beats good old homemade Green Cleaners! They're definitely, hands down, the cheapest way to go, and you don't have to worry about the toxic chemicals. Although, I do have to admit, the automatic child cleaner idea sounds good, you should patent that! This is my first time, I hope I did it right! :) I'm going to have to look into this shower thingy, talk about a time saver! I am SOLD! How much are they, and where can I get a coupon? Where is everyone finding the coupons? Hi! I believe this is the first time I am leaving a comment, but not the first WFMW I have participated in. I am posting very late, I know, but I have been busy with Spring cleaning. Drop by my blog for a visit and to get to know me a little better. I LOVE my automatic shower cleaner! It sprays 360 degrees around the unit, so it gets everything in the shower. I thoroughly scrubbed the shower before putting it in, and I have only had to do SLIGHT touch up in 2 months. One of the best bathroom cleaning inventions!!! I wanted to hear how someone liked this contraption! I am not one to like any housework, but scrubbing showers is something I really despise - esp if it has doors and not a curtain! have one and love it. mine actually broke and sc johnson sent me a coupon for a brand new one....great customer service! oh I'm just laughing! Phillippa's comment about KY Jelly reminds me of the time I put "jelly" on my grocery list as a discreet way to remember to get more lube - and I dutifully bought grape jelly the next time I went grocery shopping. har. And Shannon, the first time I saw the ad for the doo-hickey, I had the SAME reaction as you, righteous indignation :) I haven't gotten one because our shower stall is new and specifies which cleaners are OK and I'm a leetle nervous about trying something else. Oops...forgot to put in Mr Linky what my post is about...Oil of Oregano. I use it - I LOVE it! My sister in law was visiting and let's just say housework isn't really her thing. She thought it was the dispenser for soap. I heard it go off when she was in the shower and just hoped for the best - lol! Check today's paper 3/30 - there is a $10 off coupon. :) Buy it at Walgreens and get a $5 mail in rebate. I think I might actually break down and buy one.